Lieutenant General Paul M. Nakasone assumed command of U.S. Army Cyber Command on Oct. 14, 2016. A native of White Bear Lake, Minnesota, the general is a graduate of Saint John’s University in Collegeville, Minnesota, where he received his commission through the Reserve Officers’ Training Corps. LTG Nakasone has held command and staff positions across all levels of the Army with assignments in the United States, the Republic of Korea, Iraq, and Afghanistan. 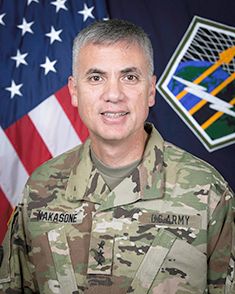 Prior to his appointment as Commander of U.S. Army Cyber Command, LTG Nakasone commanded the Cyber National Mission Force at U.S. Cyber Command. LTG Nakasone has also commanded a company, battalion, and brigade, and served as the senior intelligence officer at the battalion, division and corps levels. LTG Nakasone has served in Army assignments in the United States, the Republic of Korea, Iraq, and Afghanistan. His most recent overseas posting was as the Director of Intelligence, J2, International Security Assistance Force Joint Command in Kabul, Afghanistan. LTG Nakasone has also served on two occasions as a staff officer on the Joint Chiefs of Staff. LTG Nakasone is a graduate of the U.S. Army War College, the Command and General Staff College, and Defense Intelligence College. He holds graduate degrees from the U.S. Army War College, the National Defense Intelligence College, and the University of Southern California. LTG Nakasone’s awards and decorations include the Distinguished Service Medal, the Defense Superior Service Medal (with three oak leaf clusters), Legion of Merit, Bronze Star, Defense Meritorious Service Medal (with oak leaf cluster), Army Commendation Medal, Joint Service Achievement Medal (with oak leaf cluster), Army Achievement Medal (with four oak leaf clusters), Joint Meritorious Unit Award, Iraq Campaign Medal, Afghanistan Campaign Medal, Combat Action Badge, and the Joint Chiefs of Staff Identification Badge.